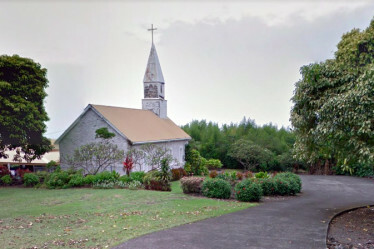 Our services are held in the pavilion of the old St. Paul’s Church in Honalo, just a few minutes south of Kailua-Kona. ake Hwy 11 (Hawaii Belt Rd.) south. St. Paul Rd. is just after the Honalo Business Plaza (near Teshima’s) on the makai (ocean) side of the street. Please drive slowly down St. Paul Rd. Pass the driveway leading to the cemetery and take the second entrance into the church parking lot. E komo mai! 10:00 AM Divine Liturgy preceded by Hours and followed by a potluck fellowship meal. For a current list of upcoming services, please visit the Services page on the parish website. St. Juvenaly Orthodox Mission was founded in 2004 as “The Orthodox Christian Mission in Kona.” As the only Orthodox Church on the Big Island of Hawai’i, and one of three Orthodox churches within about 2500 miles, we are blessed with a diverse and distributed congregation. Whether you’re on the Big Island for a quick visit, have decided to put down roots here, or were born and raised in the Islands, we welcome you to come and pray with us and experience the beauty of Orthodoxy and aloha spirit of our community.